Christmas came one day late. A special issue of the International Journal of High Speed Electronics and Systems dedicated to a previous symposium on terahertz spectroscopy and imaging applications has made its way into hardcover in the form of a Selected Topics in Electronics and Systems volume (Vol. 46). The original article was blogged on this site in post #50, including the abstract and a couple of figures from the article. The book reproduces all images in greyscale, although the cover image includes an HMX molecule in pixelated technicolor. In the interest of readability (had I known…), I’m posting the images here as a single pdf (3.0 MB). Click here or on the image above to download the image pdf. The inherent advantages and potential payoffs of the terahertz (THz) regime for military and security applications serve as an important driver for interest in new THz-related science and technology. In particular, the very rapid growth in more recent years is arguably most closely linked to the potential payoffs of THz sensing and imaging (THz-S&I). 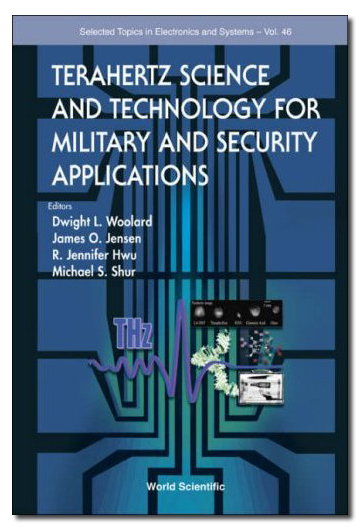 This book presents some of the leading fundamental research efforts towards the realization of practical THz-S&I capabilities for military and security applications. Relevant subjects include theoretical prediction and/or measurement of THz spectroscopic phenomenon in solid-state materials such as high explosives (e.g. 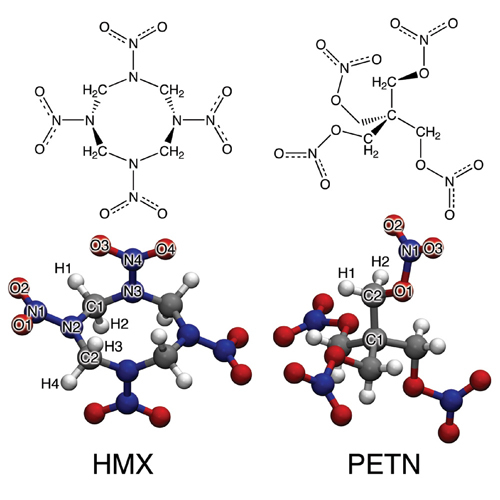 HMX, PETN, RDX, TNT, etc. ), carbon-fiber composites, biological agents (e.g. DNA, RNA, proteins, amino acids) and organic-semiconductor nanostructures. Individual papers also address the effective utilization of state-of-the-art THz-frequency technology in military and security relevant scenarios such as standoff S&I, screening of packages and personnel, and perimeter defense. Technical papers introduce novel devices and/or concepts that enhance THz source and detector performance, enabling completely new types of sensor functionality at THz frequency (e.g. detection at nanoscale/molecular levels), and defining new and innovative sensing modalities (e.g. remote personnel identification) for defense and security. Therefore, the collective research presented here represents a valuable source of information on the evolving field of THz-S&I for military and security applications. Get your copy HERE. In the right discourse community, it makes a great gift.